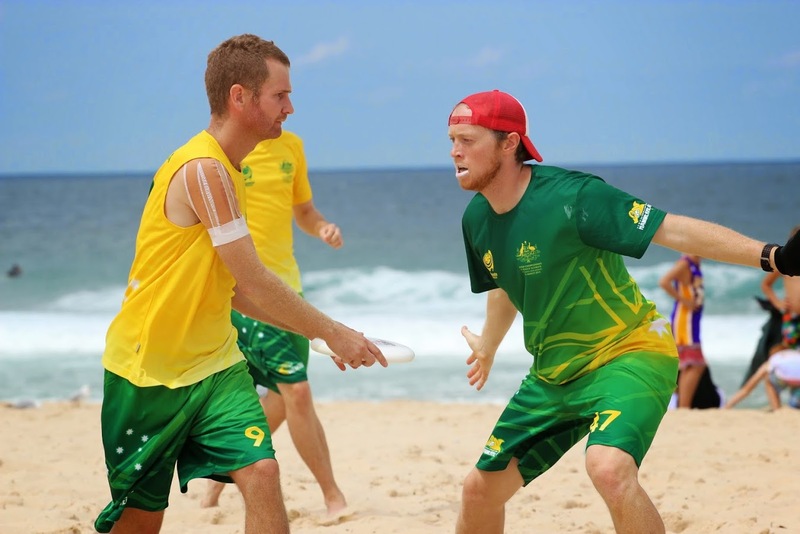 Happy to bring you the latest interview with Luan Mckenna, captain of the Australian Mixed Beach team for WCBU 2015. For those that don’t realise,Luan follows in a distinguished line of Irish exports to Australian ultimate! In Dubai he will be proudly leading out the Ozzies! How has the training been going? Easier than Ireland, cos it’s Summer down there? I’ve been getting to the beach as often as possible in the last few months. At least a couple of times a week for a throw or a pick-up game. Al Murray (who is on the Aussie Mixed Masters team) and myself have ensured Friday games on Bondi after work followed by sun downers became a mandatory finish to the working week. We are lucky with the timing of WCBU as it falls at the end of our Summer so we have no excuse not to be acclimatised. In fact we’ve mostly been training in hotter conditions than we’re due to face in Dubai. How geographically spread out is your team? How do you manage meeting up? Of the 15 in our squad we have: 2 in Perth (4,000km away), 2 in Adelaide (1,400km away), 3 in Brisbane (1,000km away), 1 in Townsville (2,000km away), 3 in Melbourne (870km away), 1 in Wellington (2200km away) and 3 here in Sydney. 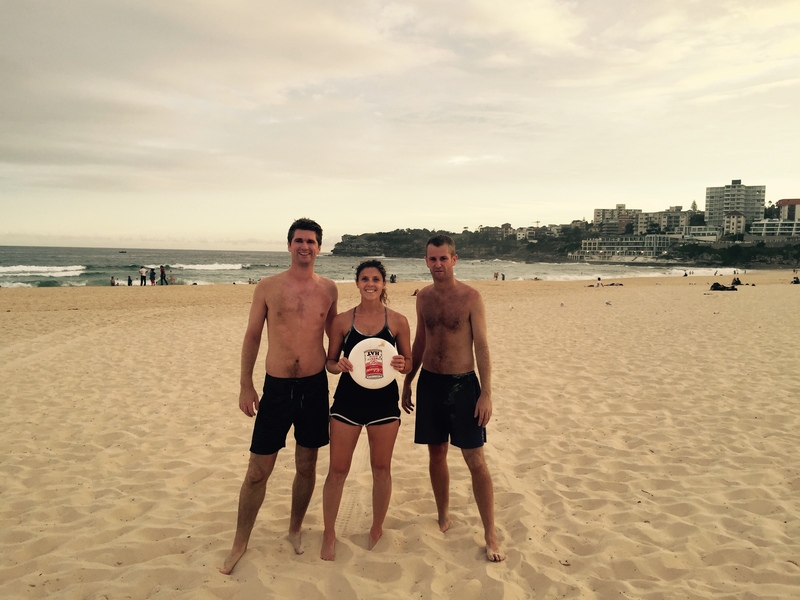 We had two trial sessions last November, one in Sydney and the other in Melbourne. Then we had one weekend with our teams in Sydney after the selections. It’s not much time at all to get to know each other. It’s just so difficult to get together more often due to how stupidly big this country is. We’ve only had the one weekend in Sydney where we trained together. Apart from that everyone has been left to their own devices to get fit and throwing on the sand. No. Despite Australia having more beaches than any other country in the world there are a conspicuous lack of beach tournaments. There’s an Australia Day tournament on the Gold Coast in Queensland every January but no other regular ones with decent attendance. Most peculiar. Irish captain of Oz, how does that feel? Are you more Oz than Irish now? I feel weird, excited, proud and honoured. I was surprised to make the team never mind end up captaining it. I had been in touch with Brain about playing on the Ireland Open team only to scupper his plans by pulling out once I found out I made the team here. I still feel very bad about that and will be buying him a beer or two at the beach as well as cheering both the Ireland teams on. I’ll always be more Irish than Aussie. I could be living here 80 years (not that I’m planning to) and I’d still be cheering as loudly for Ireland as I did at the last rugby world cup when we beat the Aussies. That said, I’ve been here over 5 years now and it has been good to me. The lifestyle here is hard to beat. From the wet playing fields of UCD to this! I remember back 2000 ish, you always seemed one of the less keen players, more likely to be kicking a round ball, was it a slow burn for you to reach this point? A fair observation. I strongly disliked school and was keen to throw myself into as many new activities as possible upon embarking at university. Along with Frisbee I played hockey, football, wrote for the UCD Tribune, worked on Bellfield FM, did debating, worked for the Student’s Union and still had time to get drunk at least 4 times a week. I remember going to my first tournament ever in Edinburgh, at the indoor beginner’s tournament in 2000. I found the spirit stuff weird, having come from an all-boys rugby school, but I bloody loved the whole thing. Oisin Flanagan insisting we all walk home naked from the pub on the Friday night, because “it was tradition,” is one of many amusing events from that weekend. It was a tradition I made sure to perpetuate when I returned a few years later as one of the more experienced players. I think I stopped playing as it got a bit cliquey for me in UCD for a while. Ironically it was the inaugural WCBU in Portugal in 2003 that rekindled my passion for the game, and the flame hasn’t flickered since. Me, Peter Lord and James Earley drove from Dublin through France and Spain into Portugal in my Renault Clio with two surfboards strapped to the roof. The plan was to meet up with Mark and party and cheer on the Irish team. We had an epic time. The mixture of competition and fun was immensely appealing to me. I’ve been a disciple of the Patrick van der Valk way of life ever since. I remember thinking I’ve got to get back playing Frisbee so I can play at tournaments like this. I was at the last WCBU in Italy, captaining the Currier Islands Open team, and I had a great time off the field but let myself down on it as I had done next to no training or fitness. The balance swung too far in the fun direction at the expense of playing well. This time I want to go compete as best as I individually, and we as a team can, while still having fun with old and new friends from all over the world. Currier Island, good fun, but more meaningful / better to be playing with regular team mates this time around? It’s very hard to compare the two. There is definitely something special about being part of a team, being selected, seeing it come together and being there to support one and other. That said playing for CI meant playing on a team of people I hardly knew or had never met before. It was like playing at Bar do Piexe, and that’s always amazing fun. Two very different but hugely enjoyable experiences. Which teams are you looking forward to playing? Ireland and who else? Definitely looking forward to playing the Irish. They look strong and have a lot of familiar faces on it. I streamed the final of Euros two years ago on my laptop in my living room late on a Sunday night in Sydney when they lost to the Swedes. They were fantastic and did us really proud. I’m sure they’ll be looking to build on that. I love playing against the Portuguese as I know a few of them from BDP and they are always fun. Really though I love playing against the different styles and cultures that you encounter at a tournament like this. I remember last time being amazed at the athleticism of the Philippines and humbled by the friendliness of the Indian team. It’ll be great to see what the UAE are like, especially as they are the home team too. Have any of you been to Dubai? What do you think it’ll be like to play there? I’ve never been but a couple of players on our team have. I think it’ll be grand. Weather wise we are well placed and the beaches look soft but not too heavy from what I’ve seen. What is your approach to the local laws? I think this is something that has been over hyped. I’m not at all worried about this. Once we follow the rules and advice from the tournament organisers I don’t foresee any issues. That said with over a thousand players in town maybe the police may feature in a story or two by the end of the week. We are not implementing an alcohol ban. I think it’s important that we socialise with the other teams after games. If that involves a beer or two, great. That said I, like my other teammates, have a responsibility to the team, and playing hungover would be a dereliction of that duty. Take it easy during the week booze wise and then enjoy the final few days is what I reckon. Predictions – who do you think will contest the final in your category? It’s always very hard to guess this as you don’t know which countries have stacked certain teams. You can’t look past the Americans though. I’d say the Canadians and Swedes could mount a strong challenge too. Last time the Aussies sent a very strong mixed team and came third. We have a good team this year but are probably the weakest of the three Aussie teams attending. That said I think our pool looks weaker than the other pool, despite the presence of the Americans. It’d be great to finish in the top 3 in our pool and then see where we go from there. Due to the unpredictable nature of the quality of teams I’m not actually too fussed about where we finish. Doing as well as we can in every game is my objective. We’ll know if we’ve played poorly and let one slip away from us, and similarly we’ll know if we’ve played well and got the result we deserved. Who do the Aussies on your team want to beat? I’m not sure really. There’s no real grudge matches I can think of, except for the Brits of course! I’d love to get one over on the Irish but will be cheering them on in every other game they play. We also have two ex-pat Canadians on our team so maybe they’ll be gunning to get one over on America Junior eh. Just to thank you for getting me to delve through the recesses of my memory to recall various tournaments and amusing anecdotes, many of which I probably can’t share with you here. Do ask Marko to explain the scar on his right wrist, if you haven’t already, if you want to get more of an idea of those stories.